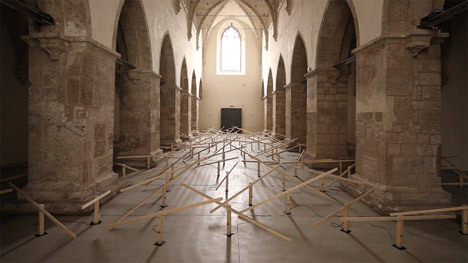 The sounds of 150 mechanical seesaws striking the floor of a former church in Austria reverberate around its nave in this installation by Swiss artist Zimoun (+ film). Named right after the resources employed in its creation, Zimoun’s most current installation is titled: 150 ready dc-motors, 270kg wood, 210m string wire. The artist utilized the wood to develop 150 easy seesaws, produced from lengthy batons that pivot vertically on brief upright lengths. Orientated in diverse instructions, these are scattered about the nave and transepts of Klangraum Krems – a Gothic church converted into an events room in the Austrian town of Krems an der Donau. Every single seesaw incorporates a motor that powers a thin metal arm, which is connected to one finish of the rocking wooden element by piece of wire. When the motor is activated the arm flicks back, pulling the string taught and triggering the finish of the wood to strike the ground. 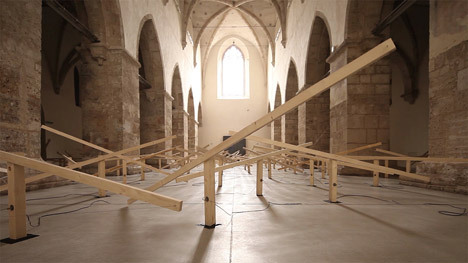 “In excess of a basic mechanical technique the wooden laths are set in motion and randomly falling back to the floor,” stated Zimoun. All of the wooden assemblages move at diverse occasions, producing a discordant mixture of sounds that are amplified by the acoustics of the cavernous area. 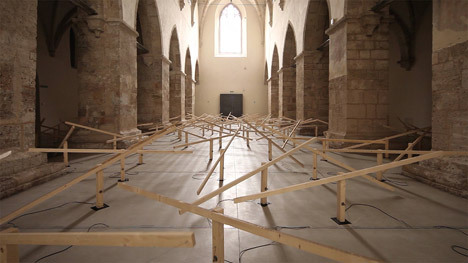 “The sum of all individuals person programs is producing rich textures in sound and movement, although the architecture of the church is reflecting and amplifying all the tiny sounds all over the room,” Zimoun stated. 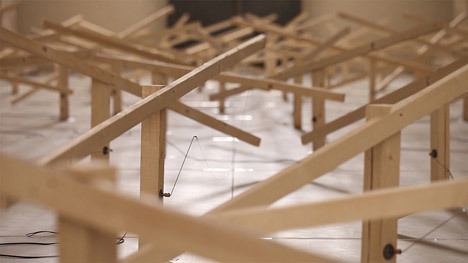 The installation runs until finally 26 July 2015 and builds on Zimoun’s preceding sound-primarily based set up, in which 250 wooden poles hung from the ceiling of a warehouse randomly pummelled the floor. Zimoun’s other work with motors has included 3 installations produced up of cardboard boxes, which the mechanical parts added jostling and spinning motions to.